The new K-Link communication method is an upgrade of the easy plug & play 0-10V, allowing users to network multiple A360X together(up to 32 fixtures per chain) and set individual groups to run their own programs. 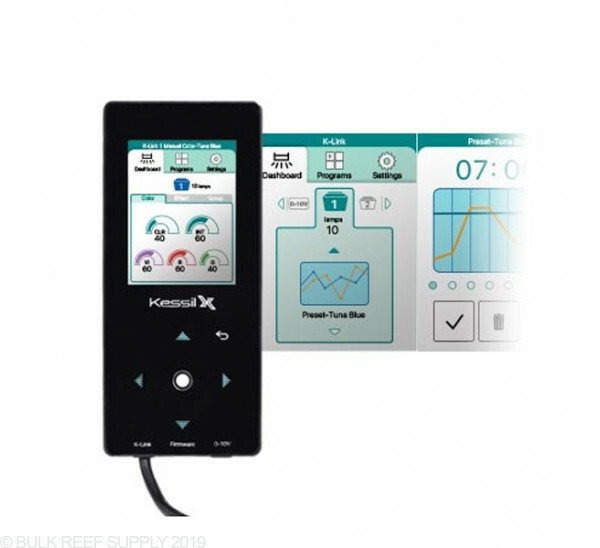 K-Link is also a two-way communication, meaning the Spectral Controller X can detect the number of lights in the network, the status of the lights, etc. Quick Set - Create unique dawn and dusk effects by altering light intensity and color throughout eight different time points. Acclimation Mode - Simplify the introduction of new lights to a tank or new corals to an existing setup with acclimation mode. The acclimation timeline can be customized to suit specific needs. 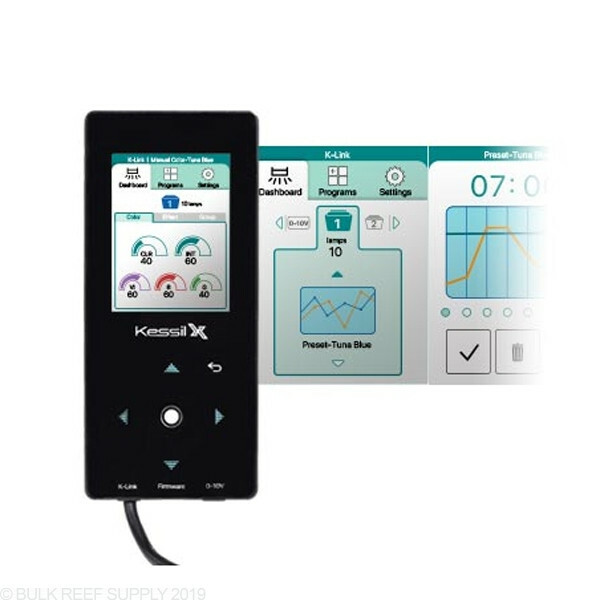 Kessil Spectral Controller X is backwards compatible with a wide variety of lights and includes a 0-10V port along with a K-Link connection, meaning you will not need to get new cables or equipment to control your lights. Come up guys, you have experienced so much WiFi issues with your AI, Apex, Amazon Alexa etc. The wired connection is just the safest way to do it, no doubt about that. I understand their logic, a separate WiFi dongle to avoid interference. Just wish the WiFi Dongle can come out earlier. The controller itself is good to use, you can control the additional colors and programming the eight points are not that hard. Same concept as the previous controller, if you are new, true that there is some learning but nothing hard. Firstly, that reviewer Josh seems to be reviewing the concept of a physical controller vs phone/tablet app, rather than this light controller itself. Works just like the previous generation controller, but they allow you to mess with other colors like red and purple, which might be too much power for tinkerers. Overall nice, but having to spend 100 bucks to control the light you just spent 450 bucks on is tough. This controller is anything but intuitive and there are no worthwhile instructions available for it. You can download the 'user's manual' from Kessil's website but it's too vague to be of any practical use. So frustrating. For such an expensive light / controller combo, produced by a tech savvy company, this controller is a sad disappointment. I agree with the previous reviewer, Kessil could have done much better with an app driven control system for the new A360X LED Light. Total waste of money. They need a phone app for all their lights not just AP700’s, keep up with the times kessil. For 100 dollars, this doesnt offer much. They could have got rid of the display and touch controls, installed bluetooth, and created a phone app. It would be much cheaper and a lot better. In the description it says “all A360” lights yet it doesn’t work with the A360WE. Buyer beware. Are the capacitance buttons back-light? They look like they are in the photo, but my controller buttons are not. These controllers will not have backlit buttons. Have a great day! At this time the Spectral-X Controller will only work with the latest Kessil A360X lights. The connection cable is USB-C for this controller and not adaptable to the 3.5mm stereo input of the standard A360/A160/A80 lights.